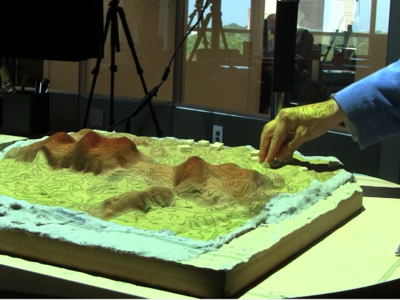 Tangible Landscape (formerly known as TanGeoMS) is a collaborative modeling environment for analysis of terrain changes. 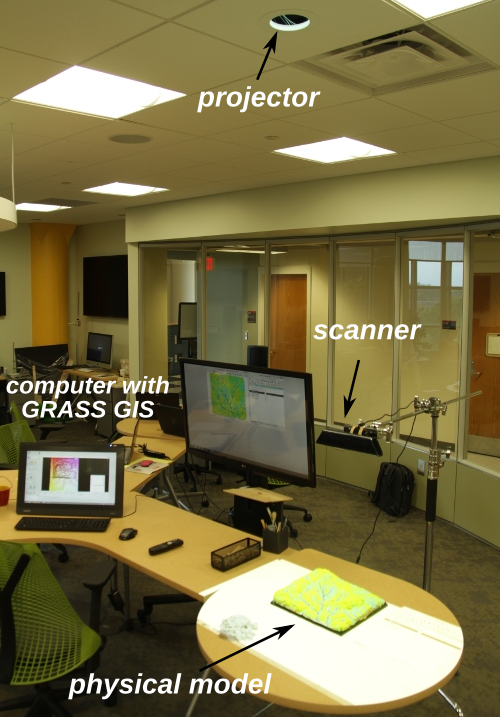 We couple a scanner, projector and a physical 3D model with GRASS GIS. 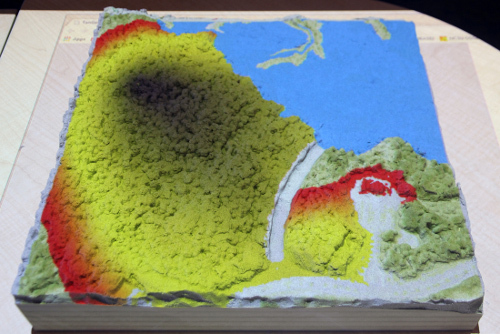 We can analyze the impact of terrain changes by capturing the changes on the model, bringing them into the GIS, performing desired analysis or simulation and projecting the results back on the model in real-time. 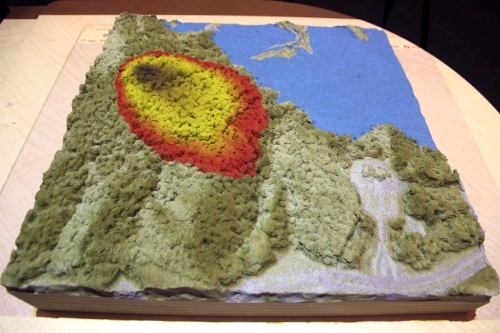 Tangible Landscape, as an easy-to-use 3D sketching tool, enables rapid design and scenarios testing for people with different backgrounds and computer knowledge, as well as support for decision-making process. Tangible Landscape has been used for a variety of applications supported by the extensive set of geospatial analysis and modeling tools available in GRASS GIS. We have explored how dune breaches affect the extent of coastal flooding, the impact of different building configurations on cast shadows and solar energy potential, and the effectiveness of various landscape designs for controlling runoff and erosion. Have a look at the official website, book, webinar, Youtube channel, and Google+. 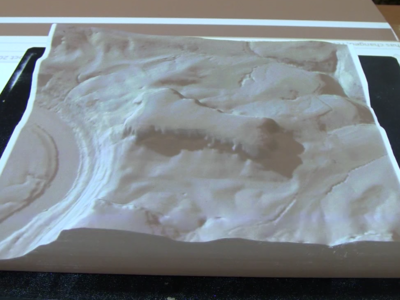 The software is free and open source and you can download it and use it in your own setup of Tangible Landscape. 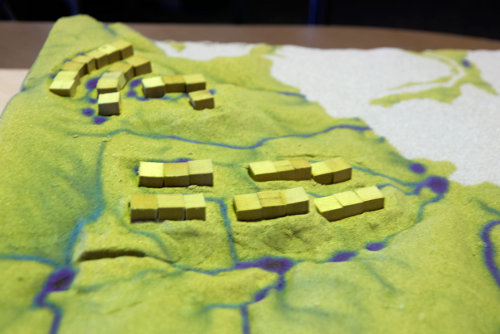 The main idea of the Tangible Landscape project is to make GIS, and geospatial modeling in general, accessible to everybody through tangible and intuitive interface. Moreover, our goal is to make the system itself accessible to everybody, so we are using using free and open source software wherever possible and also software we develop is publicly available under free and open source license. In December 2014 we renamed our project to Tangible Landscape. This new name is not only easier to pronounce and remember but also explains a little bit the main idea behind the product. We say Tangible Landscape project/product/system/environment/station or just Tangible Landscape depending on the context. TanGeoMS (or Tangeoms) is the name we were using before and you can find it in publications and presentations published in past. TanGeoMS stands for Tangible Geospatial Modeling System or Tangible Geospatial Modeling and Visualization System. We consider the terms tangible GIS, tangible user interface and interactive sandbox to be general terms which should be used to refer to all systems based on these principals. We experiment with different materials and approaches to build models. 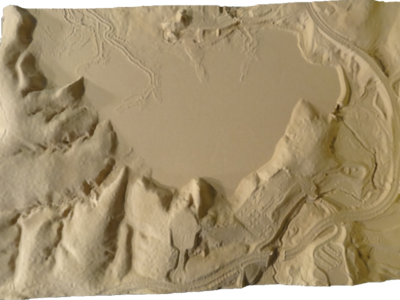 Automated ways to create a model of a real digital elevation model include carving with CNC router and 3D printing. Since carved models are not malleable, we put a layer of sand on top. We use sand enriched with a polymer which is easy to sculpt and sticks together. These are examples of using Tangible Landscape to design new development scenarios and study their environmental impact. 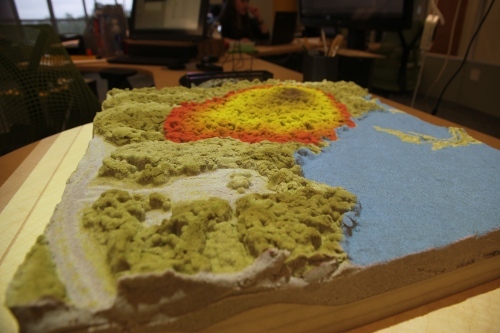 Model of our study site, Lake Raleigh Woods near Centennial Campus, represents two times vertically exaggerated digital terrain model with scale of 1 : 1500. One of the applications of Tangible Landscape is simulation of wildfire spread and its change based on creating firebreaks.